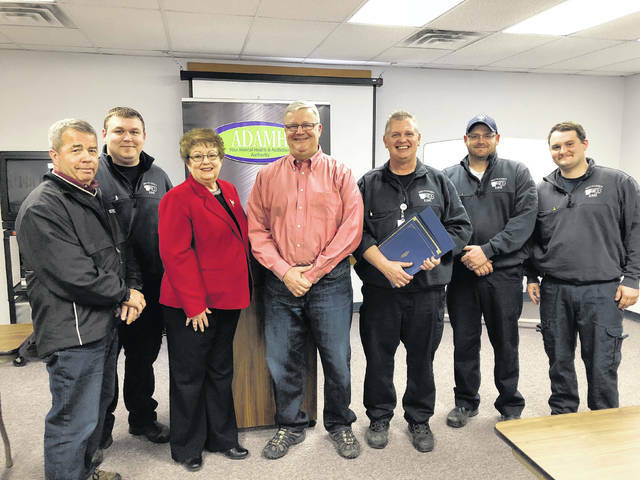 Fayette County Commissioners Tony Anderson and Dan Dean joined ADAMH Board Executive Director Penny Dehner Tuesday in recognition of first responders. The Paint Valley Alcohol, Drug Addiction and Mental Health (ADAMH) Board and the Fayette County Commissioners gathered at the Fayette County EMS complex in Washington Court House Tuesday to show their appreciation for those on the front lines of Ohio’s opioid epidemic. With the message, “Bringing Help. Bringing Hope. Thank You,” pizzas are being delivered to first responders in appreciation to all of the individuals on the front lines who are working to eradicate opiates and help individuals coping with addiction recovery every day. The Fayette County Commissioners presented a resolution expressing their gratitude and appreciation to all community members working on the front lines in the fight against Ohio’s opioid epidemic. A resolution from Ohio Governor Kasich was read, as well as a certificate of recognition for all Fayette County first responders from the Ohio Attorney General. In addition to the Day of Appreciation, ADAMH wants to help first responders cope with the additional stress that comes along with being on the front lines. Secondary traumatic stress is the emotional duress that results when an individual witnesses the firsthand trauma of others. Its symptoms mimic those of post-traumatic stress disorder (PTSD). ADAMH will be providing a Secondary Trauma Symposium for the first responders in the board region. The first will be held on Wednesday, May 9 at the Ross County Service Center in Chillicothe, and the second will be held on Wednesday, May 30 at Southern State Community College in Washington Court House. The attendees will learn coping skills and receive additional resources, including a self-care video from the Ohio Mental Health and Addiction Services. The Paint Valley ADAMH Board is a political subdivision of state government created in 1967 by the Ohio legislature to ensure the availability of community-based alcohol, drug addiction and mental health services for the residents of Fayette, Highland, Pickaway, Pike and Ross counties. https://www.recordherald.com/wp-content/uploads/sites/27/2018/04/web1_PictureForRyan.jpgFayette County Commissioners Tony Anderson and Dan Dean joined ADAMH Board Executive Director Penny Dehner Tuesday in recognition of first responders.